Munich and her outskirts are surprisingly easy to explore on a bicycle and being such a green and safe city, cycling is a very pleasant experience. It is so safe thanks to an extensive cycle path system (800km) and a safe driving culture. Drivers ‘look out’ for cyclists in Germany. 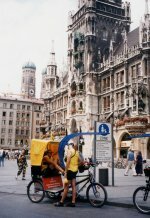 At Marienplatz, they offer Rickshaws for sightseeing (see picture). Cycle paths also run past the Isar meadows to Landshut and Bad Tölz and the parks have many cycle paths too. Why not try a Munich bike tour in the hands of professional guides.